Olga Lazovich, later known as Olgivanna, was born on December 27, 1898, the last of nine children, in the once independent kingdom of Montenegro, part of the Serbian Empire. Her father, Iovan Lazovich, was Montenegro's first chief justice. Her mother, Melena Milianov, was the youngest daughter of Marco Milianov, a war hero and the general who had led the Montenegrin and Serbian armies against the Turks.1 Olgivanna died of tuberculosis in a Scottsdale, Arizona, hospital on March 1, 1985. At the age of eleven, Olgivanna was sent to live with her married sister in Tiflis to receive the benefits of an education in Czarist Russia. By 1915, with the revolution beginning to erupt in Russia, Olgivanna's Montenegrin pedigree was more hindrance than help. At the impressionable age of 15, her sister arranged a marriage for her to an older man, a Russian architect, Vladimir Hinzenberg. Four years later, in Tiflis, Olgivanna and her husband encountered Gurdjieff and his students working to establish themselves after fleeing the Russian Revolution. Olgivanna was nineteen, a lady of society in Tiflis, which, according to Russian composer Thomas de Hartmann, was a city of great culture, with an opera house that rivaled the Opera-Comique in Paris. However, Olgivanna, by necessity, was going to give it all up—before it was lost to the revolution—and convince her husband that Gurdjieff was their future.2 It is thought by some that Gurdjieff was the father of her daughter, Svetlana.3 Though her husband had no interest, Olgivanna became Gurdjieff's pupil and followed him first to Constantinople with other students and then to Europe before finally settling at the Prieuré, where Gurdjieff established his Institute for the Harmonious Development of Man. Following Gurdjieff's accident and the closing of the Institute in August 1924 to most of the students, Olgivanna lived in Paris, her husband and daughter having earlier gone to the United States. Employment for Russian emigrants in the 1920s was next to impossible to find. Olgivanna could only find work as an attendant in a woman's lavatory. Eventually, she went to Chicago where she had a fateful meeting with the 57-year-old architect Frank Lloyd Wright. Tumultuous times ensued as both were legally married to others. At great expense, financially and emotionally, Olgivanna and Wright married in August 1928, shortly after the birth of their daughter, Iovanna. In 1932, at Taliesin in Wisconsin, they established the Taliesin Fellowship, a renowned and some would say infamous school of architecture and allied arts. It was announced that what would be taught would be architecture based on Wright's concept of organic architecture. Olgivanna envisioned the Taliesin Fellowship as a genuine extension of the Institute for the Harmonious Development of Man. Gurdjieff was the first formally invited guest. He visited again in 1933–34, hoping to establish a center, but Wright, though impressed, was opposed. Frank Lloyd Wright was inspired by Olgivanna to write his "Organic Commandments": Love is the Virtue of the Heart. Sincerity the Virtue of the Mind. Courage the Virtue of the Spirit. Decision the Virtue of the Will. His writings and statements indicate that he was a spiritual man; however, he often stated that his religion was Nature, and often chided those who spoke of the idea of religious doctrine. 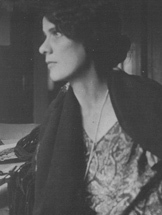 The Taliesin Fellowship which they jointly created in 1932 was based on the Work, the conditions Olgivanna experienced in Tiflis and later at the Institute for the Harmonious Development of Man in France. Both Taliesin in Wisconsin and Taliesin West in Arizona were organized according to Gurdjieffian principles. 1. Roger Friedland & Harold Zellman, The Fellowship (New York: Harper Perennial, 2006), 43. 2. Thomas and Olga de Hartmann, Our Life with Mr. Gurdjieff (New York: Arkana, Penguin Books, 1983), 131. 3. Jessmin and Dushka Howarth, "It's Up To Ourselves": A Mother, a Daughter, and Gurdjieff (New York: Gurdjieff Heritage Society, 1998), 220. 4. James Webb, The Harmonious Circle: The Lives and Work of G. I. Gurdjieff, P. D. Ouspensky and Their Followers (New York: Putnam's, 1980), 248.